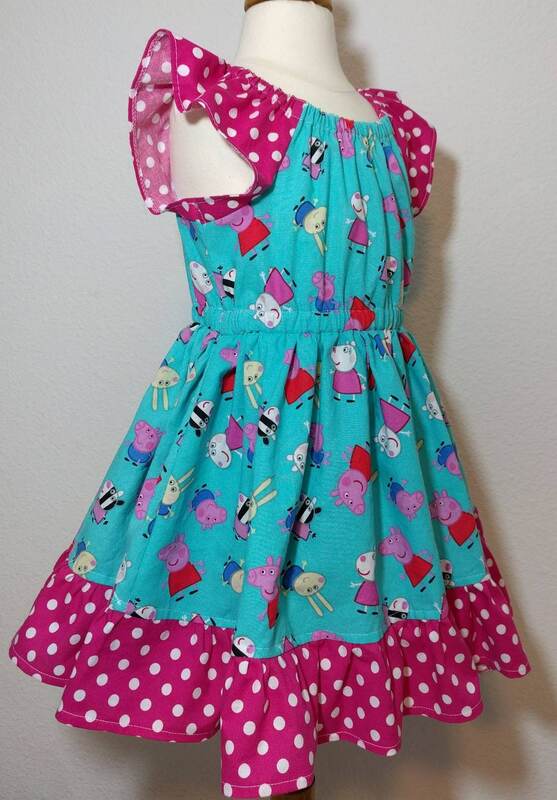 Peppa Pig and her friends adorn this fun character dress! 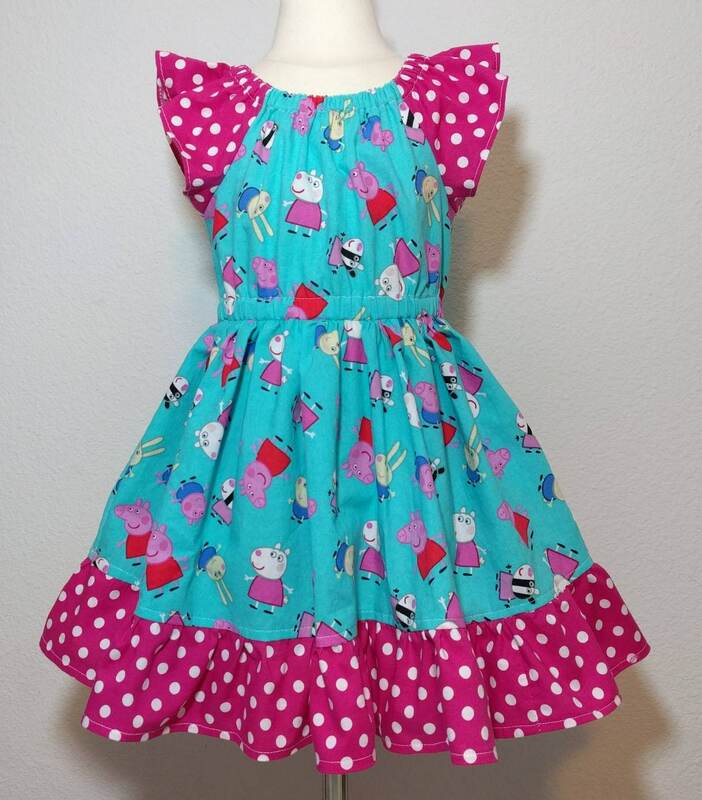 Your little girl will love the twirl and comfortable fit and you can soak up the compliments! Professionally finished seams and quality construction assure it will hold up through lots of wear. And she will want to wear it all the time! Flutter sleeves, full twirl skirt, bottom ruffle, elastic waist line and elastic neckline. Made with 100% cotton that has been prewashed and dried to avoid garment shrinking. All Lilies and Lizards, LLC items meet CPSC standards for compliance. I do not accept exchanges or refunds on made to order items and custom order items. Please be sure to select the correct size; I'm happy to help with that. If I have made an error in creating your item (IE: sent the incorrect size, or sent a wrong or defective item) please contact me IMMEDIATELY so I can resolve the situation. If no size chart is available in the listing images or listing body and you are unsure what size to order, please contact me to discuss. You may also simply order the size your child normally wears and provide a chest and waist measurement in notes to seller so that I can blend sizes as needed or select a different size based on those measurements. Most of the items are true to size but if your child is thinner or thicker, taller or shorter than "average", please message me to discuss. I do not offer wholesale pricing. However, if you are a retail location that is interested in carrying my items, I can offer a small discount for bulk orders. Please contact me to discuss. Really adorable! Arrived quickly and exactly as shown. Awesome Peppa Pig dress for my daughter's 2nd bday party. She LOVED it, and so did everyone else! Thank you! 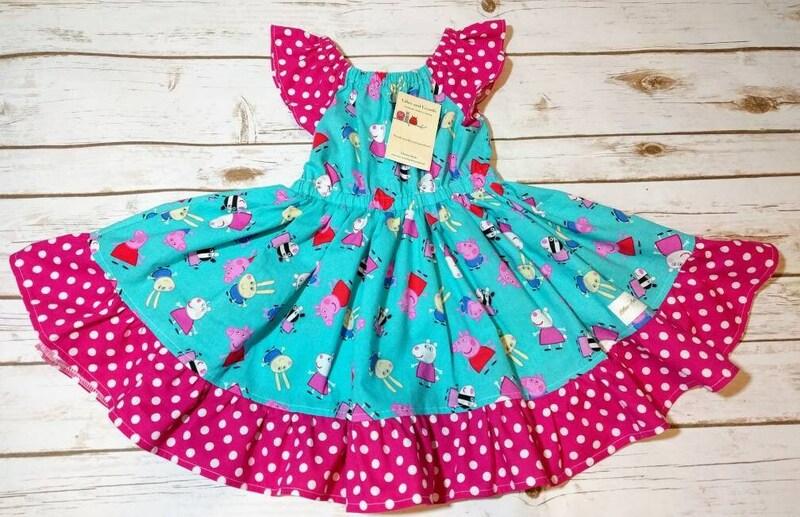 I ordered the Peppa pig dress for my daughter. She is in love with it! Won't stop wearing it! Thank you so much! !